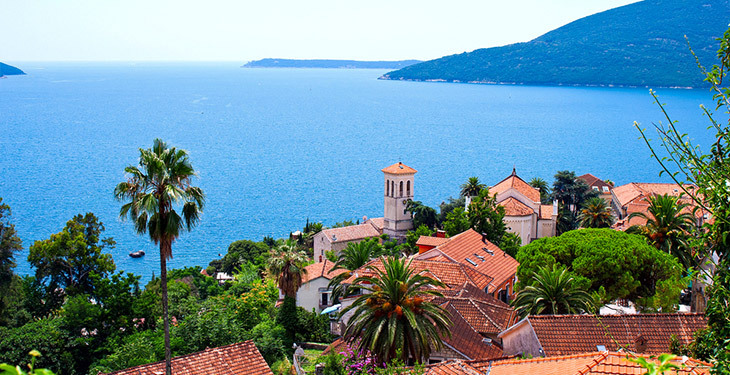 Explore Croatia, Montenegro & Bosnia. 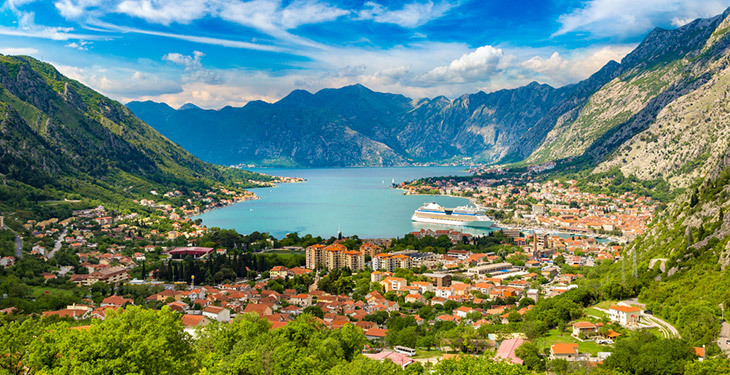 Explore the beauty of Croatia, Montenegro, and Bosnia on this 8-day multi-sport tour. Bike, hike and paddle through Croatia, Bosnia, and Montenegro. Explore the natural, cultural and historical attractions of the Balkan region first-hand. Enjoy spectacular views of historic towns and coastal islands as you hike your way through the rolling mountains in the countryside outside of Dubrovnik. Be awe-struck by the crystal clear waters in the bays of Montenegro and see a side of Bosnia that few get to experience as you travel by bike through mountain valleys and quaint villages. Cycle along rivers and streams lined with lush foliage on the railroad trail that's been deemed "an open-air museum." Finish your trip by kayaking the jade-green rivers of Bosnia and enjoying the sunshine. Day by day you'll travel and explore one of the most scenic and culturally-rich areas of Europe where rivers meet the sea, West meets East, and Orient meets the Mediterranean. After arriving at the Dubrovnik airport, take a shuttle to Cavtat and check in to your hotel. Spend your evening enjoying a welcome dinner with the group and relaxing after your long journey. Today you'll have a short drive to the village of Kuna (2,250 ft elevation) where you'll start the hike to the top of the 3,700-foot peak, following the old Austro-Hungarian military trail. Enjoy spectacular views of the surrounding towns and coastal islands, Konavle Valley, and most of Bosnia and Montenegro. Enjoy a mountain-top lunch before returning to the village and driving back to the hotel. 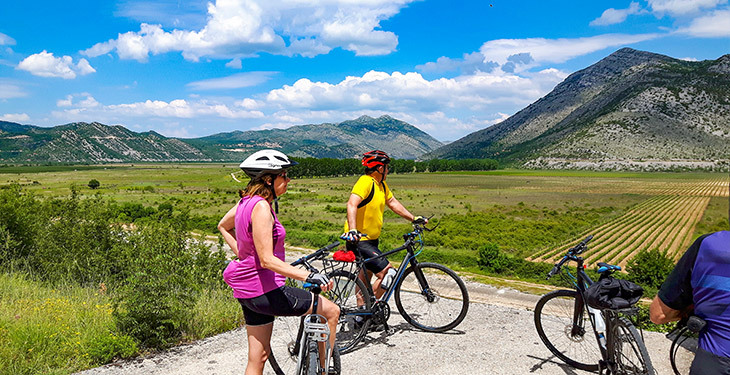 After breakfast, get fitted for your bike and cycle along the Konavle Valley and picturesque bays before crossing the border into Montenegro. You'll cycle through the coastal town to Herceg Novi and continue along the Bay of Kotor, an area with amazing views of the bay, historic towns, and the dramatic hinterland. After arriving in Kotor, you'll have free time to explore the town on your own. Today you'll leave Kotor, Montenegro by car. After a 1 hour drive in the mountain region of Montenegro, you'll leave the car and continue on by bike. Start by cycling down through the valleys of Herzegovina, passing small towns, farms and the rural region that was harshly damaged during the last war in the 1990s. In the small town of Hum, you'll turn onto the Ciro railroad path. Once a prominent railroad, the tracks have been converted into a cycling path that has been deemed an "open-air museum." You'll continue along that path to the small town of Ravno. This remote part of Herzegovina (the southern part of Bosnia) is a very different experience from Croatia and Montenegro. 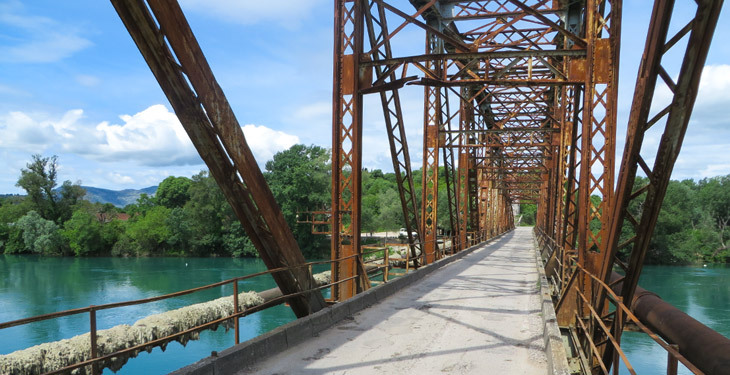 Continue cycling on the railroad trail through the rural area of Herzegovina, along the valley of Popovo Polje. During your ride, you'll be surrounded by lush valleys filled with lakes, rivers, and channels surrounding the Neretva River. This morning you'll have a change of pace. After a short shuttle ride to the starting point on the Trebizat River, you'll embark on a canoe adventure on the river. Paddle, swim, and enjoy the scenery while exploring the Trebizat. 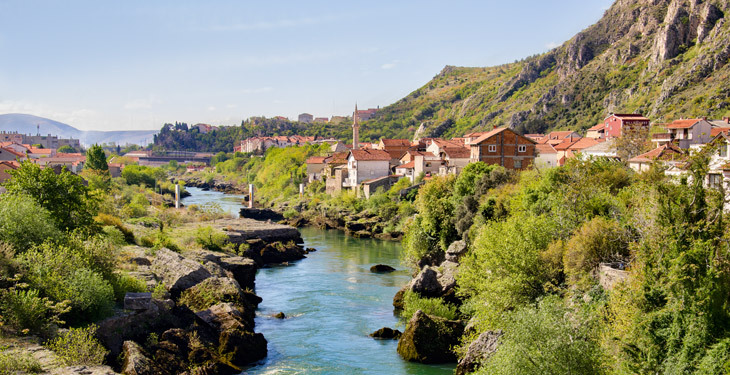 With stops to swim and take photos, you'll finish around lunchtime and enjoy a bite to eat before driving back to Mostar (45 minutes) where you'll have free time in the afternoon to explore the town on your own. After breakfast you'll leave Mostar and travel to Dubrovnik by car. The three-hour scenic drive will take you through the mountainous region of Herzegovina. 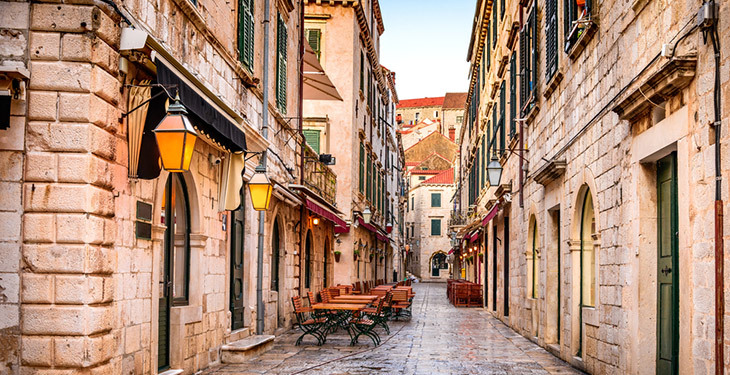 Upon arrival in Dubrovnik and after checking into the hotel, you'll take a city tour in a historic part of the city. The rest of the day is free to spend as you like. The tour concludes today. After breakfast you'll take a shuttle to the Dubrovnik airport for your flight back home. 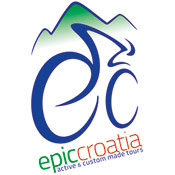 Epic Croatia is located in Dubrovnik, Croatia, where they specialize in active and custom-made tours in Croatia, Montenegro and Bosnia-Herzegovina. They are a company of professionals, passionate explorers, dynamic individuals and travel designers. Their professional and individual approach combines the best locations, authentic local experience and outstanding guide services. They work with small groups and independent travelers, creating tours with unique destinations that take you off the beaten path. 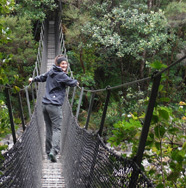 They believe in letting you explore the area at your own pace, making a true connection with the local people, culture, and natural beauty. Epic Croatia follows the principles of responsible tourism, working with local guides, businesses, and families to benefit the community. Tomi, THANK YOU for putting together the trip for me and my friends. We had a GREAT time and so much appreciated the way you accommodated our needs and interests. I would be happy to serve as a reference to any potential client who may be interested in using your company. Please feel free to have anyone contact me if they want to find out how much we appreciated working with you and Epic Croatia. I mean that. Tomi, I have let a week lapse since arriving back home to think about our trip and to remember all the good times. Thank you for showing us your country and for being a fabulous guide through the entire region. I am only sorry that I was not more familiar with the details surrounding all the conflict that took place in the 90s. Not easy to comprehend all the nuances surrounding the numerous conflicts and the history of the hatred and dislike. You did a great job of educating us. Everyone of us was thrilled by the scenery, the people, the variety of good food and how well organized you were. The extra day in Split was great and the weather was fabulous. Please note there is a 4 person minimum required per departure. Please wait to make travel arrangements until you have received confirmation from Epic Croatia. Please plan to fly into the Dubrovnik airport in Croatia. A group shuttle from the airport to your accommodations is provided. What is the group size for this trip? The minimum number of people per trip is 4 and the maximum group size is 14. You'll be staying in a combination of 3 and 4-star hotels, depending on availability. Accommodations vary from small, family run businesses, to trendy ex-railroad stations converted into hotels, to modern hotels. Yes, solo travelers can get their own room for an additional fee. The additional 180 euro supplement is payable directly to Epic Croatia. Seven breakfasts, six picnic lunches, and six dinners are included in the trip cost. Dinners will include typical Croatian food with a mix of local restaurants and hotel meals. Epic Croatia recommends budgeting at least 25-35 euros per day for meals not included and additional expenses. Passport - including appropriate visas (if you need it for the countries visited and EU), photocopies of all documents (keep separate), airline tickets (or printouts of your e-tickets with airline booking references), travel insurance details, emergency contact numbers, trip dossier, credit cards, and local currency. Croatia is in the EU but not in the monetary union. You can easily get local currency from the ATM, change in the exchange offices, or in your country before beginning the tour. For Montenegro and Bosnia the best currency to have are euros. Trainers/approach shoes, walking or biking socks, t-shirts, trekking trousers, short or biking trousers, light fleece, thick fleece (for cooler evenings), waterproof jacket with hood, sun hat, and swimwear. Daypack/rucksack, 1 water bottle, towel (a quick drying pack towel is recommended), camera & accessories, sunglasses, trekking poles (optional), insect repellent, anti-bacterial hand wash, water purifying tablets, sunscreen & lip balm. Snacks/energy bars, plastic zip lock bags. Epic Croatia recommends that you carry a small first aid kit for personal use. This could contain things like plasters, sterile dressings and bandages, a blister kit, ibuprofen, antiseptic cream, antihistamine cream (for insect bites), suncreen, anti-diarrhea pills (Imodium or Lomotil) and rehydration salts (dioralyte). Please ensure you carry essential personal medication in your hand luggage rather than in checked bags. Do you require or recommend travel insurance? If so, who do you recommend to your clients? Book confidently with Free Cancellations within 72 hours of booking. After 72 hours, cancellation fees will apply. Cancellations are subject to the full discretion of Epic Croatia. For more information on our Travel Cancellation Policy please Click Here.